Who is Hal of Hallamshire? In days of Yore, when More of More Hall defeated the Wantley Dragon an egg was left unattended at the Dragon's Den up on Wharncliffe Crags. As the years turned to centuries the egg lay dormant until one day a group of climbers came across the egg. The egg hatched and out popped a small dragon, a dragon that knew nothing of the world, where it came from or who it was. The poor creature scurried around in the undergrowth eating leaves and dead wood that had fallen from the trees. The poor little dragon wanted to make friends but didn't know how to or who would be its friend. One day a nice man from Sheffield Environmental came across the small beast. The man couldn't decide if the dragon was male or female as he'd never seen a dragon before but named it Hal, short for Hallamshire as Wharncliffe Wood, in Hallamshire Forest where he found the dragon is part of the 6th Earl of Shrewsbury's Hallamshire Estate. As time went by the man taught Hal of the past and world outside the Hallamshire Forest while Hal taught the man what life as a dragon was like in the forest. Eventually man and dragon became firm friends and the man gave Hal a T-Shirt with the name "Hal of Hallamshire" on the front and "Sheffield Environmental" on the sleeves. This was the beginning of their joint promotional and campaign work. What is the purpose of Hal? 1) To introduce a new generation to the Ballad of the Wantley Dragon. 2) To highlight the Wantley Dragon's legacy within Sheffield. 3) To inspire people to get out and discover the places associated with the Wantley Dragon. 4) To work towards the creation of a new forest destination in the North of Sheffield, making use of existing woodlands and planting new trees known as the Hallamshire Forest. As the 16th Century gave way to the 17th Century, Sir Richard Wortley the then Earl of Wharncliffe gained a reputation for being something of a dragon due to his constant battles with the locals. It seems that he wanted to elevate his status which he did in two way, one of these was by rebuilding his stately home; Wortley Hall. The other was to expand his private hunting estate Wharncliffe Chase by using dragoons to forcibly evict the residents living within the hamets of Stanfield and Whiley. Various protests took place over the following years which included the poaching of deer from Wharncliffe Chase, the nailing of a pig's head to the door of Wortley Church and the writing of the Ballad of the Wantley Dragon. The Ballad is a piece of protest poetry takeing inspiration from ancient folk tales such as "the Worm/Python of Grenoside" and "George and the Dragon" while parodying the events of the time. More of More Hall was seen as a people's hero of the time having previously won a legal battle on behalf of the free men of Sheffield against George Talbot (6th Earl of Shrewsbury), making More a perfect protagonist from the neighbouring Hallamshire estate. A few decades later the ballad was published and subsequently turned into an opera that was performed around the world, propelling the Wantley Dragon to the status of England's most famous dragon. In 1819 Sir Walter Scott quoted the beast in the opening paragraph of Ivanhoe and it has subsequently been included within the architecture of various buildings in and around Sheffield. 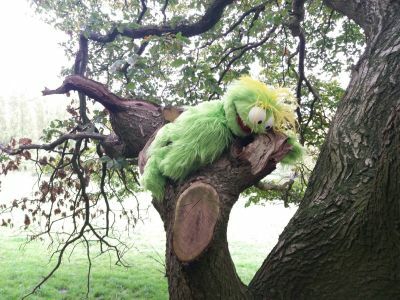 Hal has attended various events and appeared in several locations around Sheffield as part of Sheffield Environmental's campaign work. If you would like Hal to attend an event that you are organising please get in touch with us through Facebook or Twitter. Wortley Men's Club, Wortley Villiage, S35 7DB. Please watch this space for future dates. For many years Wharncliffe Crags have provided a great location for local climbers to practice their skills, although few of them realise that the 2.5km feature along with the surrounding Wharncliffe Wood harbours a legend that at one time made this area nationally and internationally famous. The Dragon's Den, located within the "Lodge Buttress" area at the Southern end of the Crags, was the home of the Wantley Dragon. The small cave is located approximately 200 metres from Wharncliffe Lodge which is a private residence. There are two ways to access Lodge Buttress, the first being from Woodhead Road near Grenoside, you can use one of the car parks or the Forestry Commission's free Car Park near Grenoside. From here you walk through Wharncliffe Chase where you will meet Lodge Lane, a private road, follow this to Wharncliffe Lodge. For the second access route park at Station Road in Deepcar and walk up the footpath on the left hand side of the road into the woods and up the hill. Along this path you pass under two bridges and eventually reach an old small industrial dam. Here take a right turn and follow the path up on to Wharncliffe Heath where you pass closely to a large electricity pylon. This path takes you along the top of the crags for most of the stretch with some great views over the surrounding area. After about an hour of walking when you're approaching Wharncliffe Lodge, you'll see both More Hall & Broomfield Reservoirs up the Ewden Valley.From here the Dragon's Den is a scramble down the cliff until we can find a way of encouraging or funding the Forestry Commission to build a new path to the bottom of the cliff. We recommend that this walk is only for the phyically fit who have at least consulted the OS Explorer No 287 map and are wearing suitable clothing. The former Deer Park is best accessed from Woodhead Road which runs between Grenoside, Sheffield and the Stocksbridge Bypass (A616). Wharncliffe Chase was the Earl of Wharncliffe's private hunting estate that around the time that the Ballad's writing was was being expanded. That expansion resulted in the destruction of the hamlets of Stanfield and Whiley. Wharncliffe Chase today is open access land that is used for sheep grazing, there is no recorded bridalway meaning there aren't rights of access for bikes and horses, all dogs must be kept on a lead. During the Summer of 2015 ITV used Wharncliffe Chase as a location for the filming of the first series of the "Jericho". While there is no access to More Hall due to it's status as a private residence there are two lanes but the V-shaped More Hall lane provides the start and finishing points a lovely walking and cycling route. For those feeling less energetic the journey by car will only take a few minutes. The two branches of More Hall Lane start at the A6102 (Manchester Road) near the Ewden Treatment Works. If you come by car and wish to walk it's recommended that you park on the left hand branch just past the stone gateway. There is ample space for parking along the woodland lane which is actually owned by Yorkshire Water and serves some of the grand residences in the valley. The lane continues up the Ewden Valley through the woodland along the banks of More Hall Reservoir. The right hand branch of More Hall Lane goes up the South facing slope up the valley side towards Bolsterstone, along the way it changes it's name to Sunny Bank Road. The two branches of the V are joined by YewTrees Lane and New Mill Bank to make a circular route that is approximately 4 miles in length. Please be aware that this route is along country lanes and there are few pavements. As you climb the right hand branch of More Hall Lane from the A6102 a short way up the hill on the right hand side is a gate with a sign and interpretation board. This is for the Woodland Trust's Beeley and Wantley Dragon Woods nature reserve. If you climb over the stile and up the hill along the grassy footpath through the woodland you come to a clearing when the path levels out. Take a left turn here and a little way further up the hill take another left and you will find the sculpture of the Wantley Dragon overlooking the Don Valley and surrounding woodland (As shown in the photo). The view takes in Wharncliffe Side, Wharncliffe Lodge and many other landmarks with an interpretation board that retells the Ballad of the Wantley Dragon. If you wish to proceed along the path the Woodland Trust have created an information page on the wider Bitholmes, Firth and Wantley Dragon Woods Trail. At the opposite end of the Woodland Trust's Bitholmes, Firth and Wantley Dragon Woods Trail is Stocksbridge Golf Course and Golf Club. Many years ago before the course was created springs were found around the site where the dragon was said to drink in an evening before flying back to his home in the crags on the other side of the Don Valley. The springs may have been covered over the water they brought to the surface chaneled away through drains but the water can still be found runing along the ditches by the side of Common Lane and Townend Lane (S36 2TN). Wortley Hall is the original home to the Wortley Family who occupied the property from it's earliest recorded reference in 1165 to 1950 when they moved away. Set in 26 acres of gardens and woodland it is a beautiful property with extensive views across Yorkshire. This was home to Sir Richard Wortley who is the historians favourite candidate for the basis of the original Wantley Dragon. The co-operative who run Wortley Hall today as a hotel and resturant welcome visitors to explore the gardens who treat them with respect. They also ask them to make a donation in reception to help with their upkeep. If you're in Sheffield and you see a dragon incorportated into a design the chances are that it is the Wantley Dragon. From the stone carving above the Town Hall's Main Entrance to the logo of Stocksbridge High School Hal of Hallamshire's Facebook page attempts to showcase some of these references. If you find any why not post them to us on Facebook or Twitter. 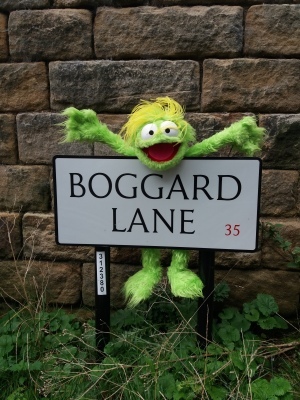 Did you know that the Hallamshire Forest is home to a colony of Boggards? They are said to inhabit Boggard Lane which can be found between Oughtibridge and Worrall. They are mysterious green creatures with an almost toad like appearance and a troublesome personality that goes with their cheeky expression. 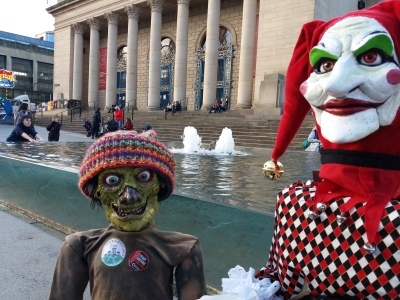 One of these Boggards has ventured out of the forest and joined up with Hal of Hallamshire to help spread the word of Sheffield's Folklore. This young Hen Harrier is he face of our Hen Harrier Day campaign work. She's on juvenile Hen Harrier that 'dissapeared' over a Scottish Grousemoor one week after the first Sheffield Hen Harrier Day in August 2017. This Calluna now lives in the uplands above the Hallamshire Forest. You can see her dedicated page here and our main Hen Harrier Day page here. Fracked Ali is the public face of Sheffield Environmental's Anti Fracking campaign work. As a human he worked in the fossil fuel industry until a fracking well blew up in his face. Now he wants to ensure that those in power know how unpopular this dirty industry is. Jester Jack is rarely seen in public, he prefers to save his appearences for the Halloween season. The photo opposite was taken at Barker's Pool during the Out of This World event in 2017. Before the rise of Christianity in the UK, Hobgoblins were seen as being helpful creatures. The arrival of the church changed all that and the poor creatures were driven into hiding below ground. Each November Garic comes out of hiding somewhere beneath the Hallamshire Forest/Sheffield Lakeland area. His aim, to help spread the magic of Christmas while raising the profile of his ancestors in the Sheffield area, like the Hobgoblins who gave their name to Hob Lane near Oughtibridge. Sheffield Environmental has Public Liability and Employer Liability insurance for up to the value of £5m. If you would like Hal to appear at an event please get in touch via one of the Sheffield Environmental and Hal of Hallamshire social media pages.